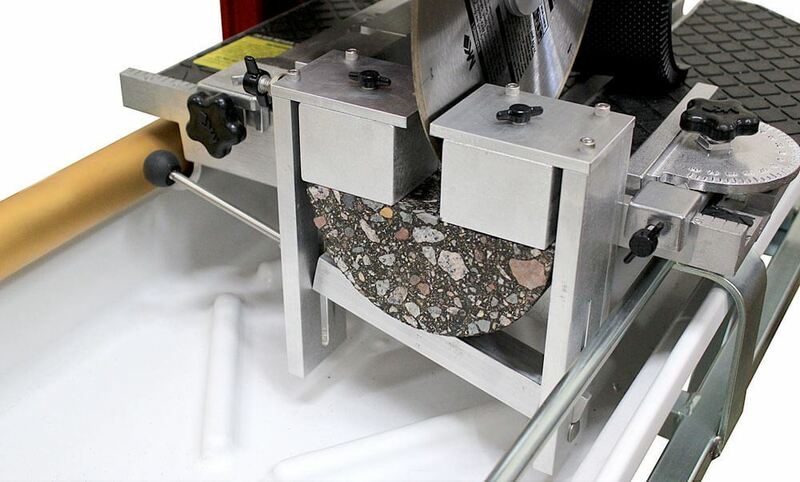 Sample Preparation Saw - Gilson Co.
MS-48 Asphalt Sample Preparation Saw is used to prepare asphalt samples for Semi Circular Bend (SCB) Testing, and for cutting samples for Disk-Shaped Compact Tension (DCT) Tests in accordance with ASTM D7313. A custom spring-clamp fixture quickly secures the specimen for required notch cuts with no need to adjust the saw blade. Simply change out the spacer blocks to switch between specimen types and notch depths. The saw will also make the required half-cuts and flat-cuts for these samples. The included 10in (254mm) diameter blade is 0.050in (1.27mm) thick to meet specified cut-width requirements. Arbor size is 0.63in (16mm). Replacement blades are available separately as MSA-222. Each saw is supplied with a precision-machined alignment block to easily verify proper blade alignment. MSA-220 Spacer Block Set for making the three notch cuts in ASTM D8044 (Louisiana) SCB specimens is purchased separately. 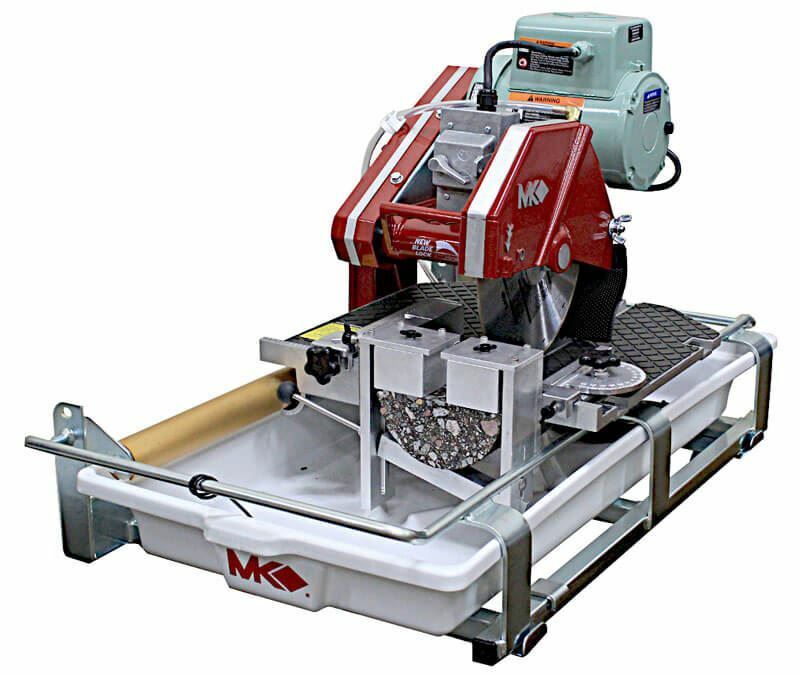 The MS-48 features a fully enclosed, high-torque, fan-cooled motor and permanently lubricated heavy-duty shaft bearings mounted on a one-piece reinforced steel frame with zinc plating. The blade guard and motor post are constructed of cast aluminum and a built-in water pump supplies cooling water to each side of the blade. A shaft lock allows for easy removal of the blade. The aluminum table has a non-slip molded neoprene surface. 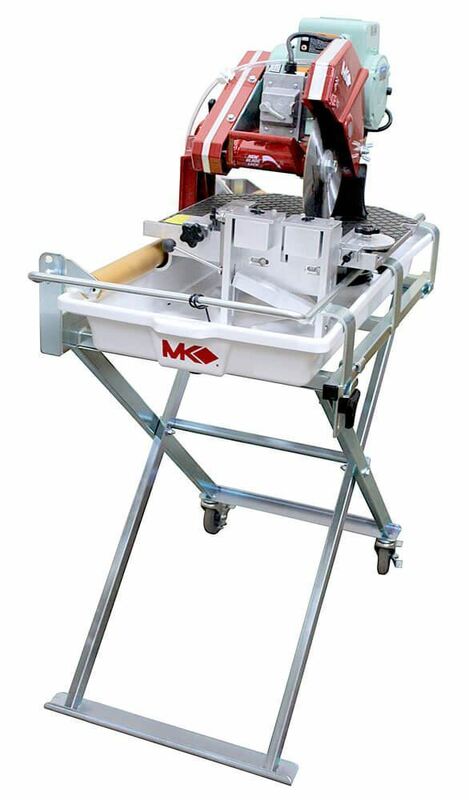 Includes sturdy steel folding stand for stable operation.